Colorado laws, the budget stabilization factor and money from marijuana all have an impact on school funding. Please see below for information about these factors. The Gallagher Amendment requires that residential and corporate tax rates be at a 45% / 55% split. Property tax rates are adjusted when this proportion gets out of balance. TABOR (Taxpayers Bill of Rights) sets limits on the amount of revenue that can be collected, imposed a limit on property taxes and eliminated the ability of local elected officials to increase property assessment rates. Amendment 23 established base per-pupil funding for K-12 education, to be increased at least by the rate of inflation. During the 2009 recession, the state legislature decided it could not fund the cost of inflation for school funding. The "Budget Stabilization Factor was created to stabilize the state budget, which reduced revenue for schools. 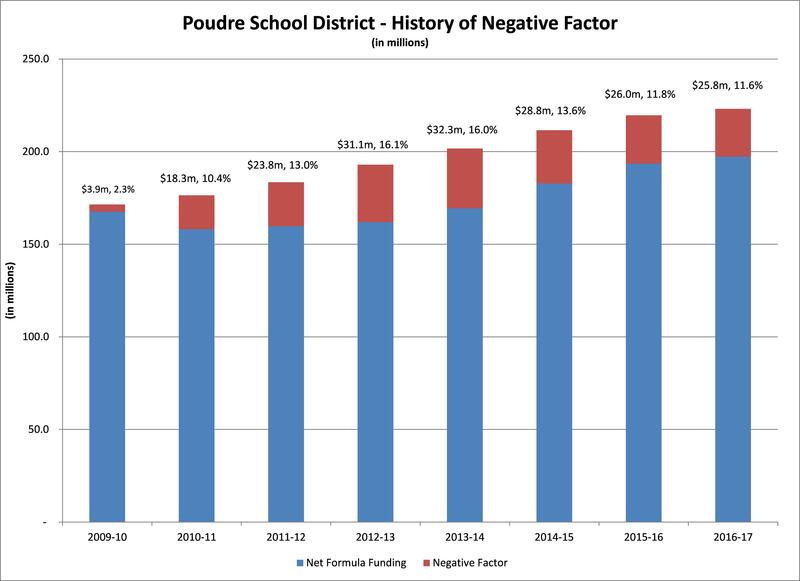 PSD sustained reductions and forfeited increases totaling $190 million from 2009-2017. PSD is currently experiencing an annual deficit of $26 million, equaling about 11.8% less than Amendment 23 calls for. In response to the reductions, PSD decreased approximately $13.7 million over two years, cutting the equivalent of 139 full-time staff. PSD froze salaries, held program and operating budgets stagnant, and did not allocate funds to new statewide initiatives. Voters approved a $16 million mill levy override in November 2010, which helped PSD withstand the impacts of the recession, but did not restore all reductions. $4.5 million from schools, with each school cutting 4.5%, resulting in about 86 fewer staffing units across all schools (60 were teachers/licensed staff). School administration was reduced by 3.6 staffing units. Schools also cut operating budgets, classroom budgets, and extracurricular programs. $5 million from district departments (non-school areas), with each department reduced by 8-10%, resulting in approximately 52 fewer staffing units. Two million was cut from district department operating budgets. $2.2 million in district-level reductions, including administrative reorganization of cabinet level positions (1 fewer position), alignment of one-time funds for future debt payments, and adjusting restricted/or non-discretionary budgets. Other budget savings were gained by closing Moore Elementary School, changing bus routes, and increasing athletic fees. 2014-15: A $81,556 grant from recreational marijuana tax funds from the Colorado Department of Education School Health Professionals Grant Program. Funds were used for substance abuse prevention. In 2015-16, the district received an additional $98,353. Spring 2016: A $216,740 grant from the Colorado Department of Education’s Student Re-engagement Grant Program to fund drop-out prevention and student engagement programs at three high schools. The district received another $93,058 to fund a second year. December 2016: A $437,824 Bullying Prevention grant for 2.5 years of bullying prevention activities at Lesher, Wellington, Blevins and Preston Middle Schools. In 2016, PSD also applied for a BEST grant for $309,000 to fund fire alarm replacements at several schools, but the application was denied. ​In 2016, these taxes amounted to about $141 million. Compare that to the $6.4 billion the state spends annually on K-12 education and Colorado's $10.3 billion annual budget. See this Colorado Office of State Planning and Budgeting chart about where marijuana money goes in Colorado. First $40 million: BEST construction fund, a competitive grant typically awarded to small, rural schools and only for life and safety items like a roof, a boiler, cracked foundation, etc. The Colorado Department of Education’s Marijuana Revenue web page shows funds collected and disbursed in 2015-16 and 2016-17. Learn how PSD dollars are spent on the Fiscal Transparency web page.